The Black Hood #2 by Duane Swierczynski and Michael Gaydos continues with an electrifying origin story that hits all the right notes in a brutal and gritty fashion. Greg Hettinger is letting his addictions run his actions and it's putting him on a collision course with a powerful drug lord. The Black Hood continues to impress with its first person narrative that finds Hettinger getting desperate for another high, whether it's from drugs or adrenaline. 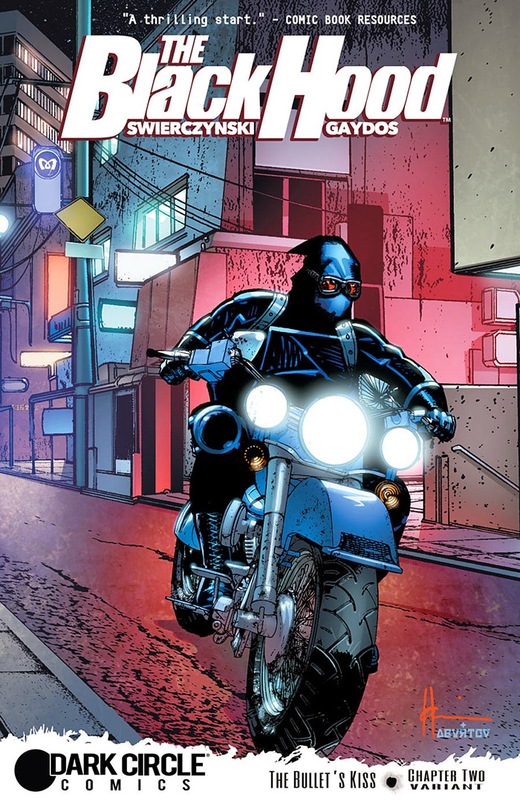 His vigilante antics give him a rush and a sense of invulnerability when under the influence. It's started to interfere with his police duties. He finds a way to meet his cravings by taking it out on local drug pushers and stealing their stash. Hettinger's carelessness and desperation has started to get the attention of the drug lord only known as The Connection. Swierczynski is a veteran crime story writer that makes it look easy. Hettinger's flow of consciousness reveals a man who knows he's flirting with danger and abusing himself but can't stop. He tries to legitimize his actions in his mind, but he keeps getting himself in deeper. It's a downward spiral that began in issue one and the cliffhanger in issue two is surprisingly clean and cleverly plotted. Gaydos has found the right look and feel for this homage to old crime stories of the 70's. The pencil work isn't about perfection or straight lines because everything in the story is crooked. The cop is crooked, the thugs and even the media. The panels are seen through a dirty filter that matches the filth of morality of the characters on the page. I feel like I'm sitting in a darkened theater watching Mean Streets or Death Wish for the first time. And I can't help but root for the pathetic junkie cop who's beating up the pushers on the street. The Black Hood is storytelling from street level. It shows that gripping tales of heroism or anti-heroism doesn't need powers or capes or morally straight characters. It's a primordial instinct to find justice in a way that the means justify the ends. Grab a copy and enjoy crime noir at its best.